Due diligence: What can the Garabit Viaduct teach us about partnerships? What do the Eiffel Tower and the Garabit Viaduct have in common? Their designer/engineer, Gustave Eiffel. The story behind the Garabit Viaduct (1884) near Saint-Flour in France is about research and testing. Until the famous tower in Paris was constructed, Eiffel was better known as a bridge builder and expert in aerodynamics – quite important when bridges need to withstand strong winds. Eiffel studied wind action by setting up meteorological stations throughout France to collect data on aerodynamics. 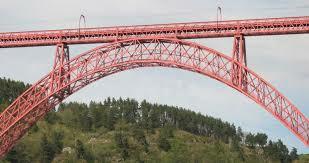 His bridge design, engineering talent and especially the completion of the Garabit Viaduct were essentially warm ups to his famed success in designing the Eiffel Tower. Years later in 1912, he continued his wind studies and built France’s first aerodynamics lab. How do you know if the partnership you’re considering will achieve the desired objectives? While you cannot know for sure, the due diligence you do prior to inking an agreement will help you have the confidence to take the decision. Not all partnerships call for the same level of scrutiny. Where money and/or technology are exchanged there is a longer list of research and testing that’s generally followed than, as an example, for a partnership that serves as a validation of your significance in the marketplace. Financial stability – Are both partners able to cover the costs of the partnership without harming the respective businesses? If not, compensation may need to be built into the agreement. Technology and intellectual property – Is the partner’s technology as good as they say it is? Test it. Customers, sales and service – Will the partner treat your customers as well as you treat them? Talk to some. Strategic and staff alignment – Do your missions align and do you serve similar or complementary customers? Is there complementary staff at both organizations to share the effort to build the partnership? Regulatory issues – This might only apply if you’re in a highly regulated industry where questions of antitrust and sharing trade secrets might be called into question. Reputation in the marketplace – This is especially important if the partnership is going to be visible to customers, suppliers and other stakeholders. Visit with your own stakeholders and understand what they think of your potential partner. Insurance – This is not usually needed for a business partnership, but you may want to consider the terms for termination as an opportunity to write in some insurance, aka safeguards, regarding the shared and borrowed assets should the relationship itself breakdown. Share a standard step you take in your due diligence efforts. This entry was posted in Causeways: business insights from the world's most celebrated bridges and tagged bridge, business insight, causeways, due diligence, Eiffel, Garabit Viaduct, partnerships by Karen Winston. Bookmark the permalink.